Surely there’s more nuance in describing al-Jabari as “the man responsible both for the abduction of the Israeli soldier Gilad Shalit and his release a year ago” than as “directly responsible for the deaths of many Israelis and for the abduction of the soldier Gilad Shalit”. 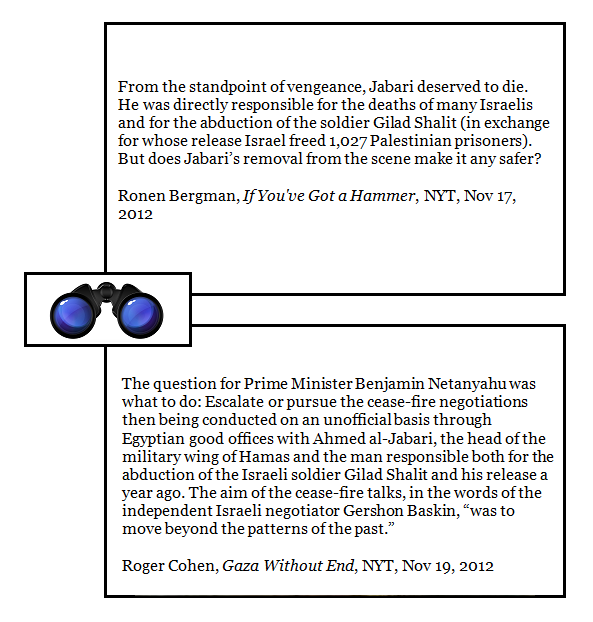 Does that mean that abducting Gilad Shalit and releasing Gilad Shalit cancel each other out? Cared for, maybe — but still incarcerated. The White Nile Bridge connecting Khartoum, Sudan and Omdurman, with 4 lanes total. Traffic is generally directed equally, 2 lanes to Khartoum and to lanes from except in the morning, where it’s 3 lanes towards Khartoum, and in the evening, 3 lanes towards Omdurman. Of course, you don’t want your efforts to make an unexpected Dynamic Lane Reversal and blow back on you. One can only wonder whether when the Israelis made the decision to assassinate Ahmed al Jabari they were foolish enough to assume that their attack would be the end of it. Having been down this same road before, where assassinations only led to escalation and then full-scale hostilities, one might have hoped that someone in the Israeli high command would have recalled 2008 or 2006 (and so many other tragic, bloody episodes in the past) and cautioned that “no good will come of this.” When I heard an Israeli Ambassador tonight saying that “we must finish them off, so we can sit with moderates and talk peace,” it became all too clear that no lesson had been learned. I sometimes wonder whether maybe outcomes are above the human pay grade.